Until I was on the Mississippi, I never realized how difficult it can be to tell if you actually are on the Mississippi. Trackless swamps, oxbow lakes, side channels and confusing bays, combined with sparsely detailed maps, make pinpointing your location troublesome at times. This should finally start to get a little easier. We’ve left behind most of the rapids sections, and the area ravaged by last year’s wind storms, which created many unwanted obstacles, is now miles behind us. If the rest of our journey is anything like yesterday, we’ll be paddling through idyllic green pastures followed by towering pines on sandy ridge while cottonwood seeds drift over the water’s surface. We’ve also started to see signs of industry. Yesterday morning we glimpsed smoke stacks in the distance which crept closer until we came upon a factory on Blackwater Lake. Not exactly prime real estate for a cabin. 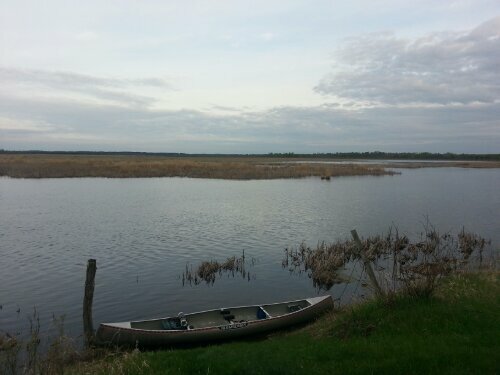 Later we had to portage 1200 yards through backyards and city streets to bypass the Blandin paper mill. And last night the most prominent sound wasn’t coyotes or ruffed grouse but an upset-sounding cow across the river. Today we took an unplanned rest day. Linnea’s elbow is bothering her and my shoulder is sore — casualties of Lake Winnie four days ago. Luckily, we’ve had some of the best weather the past two days, save for the nights which have had temperatures dropping into the low-to-mid 30s, and the nicest campsite we’ve had yet. 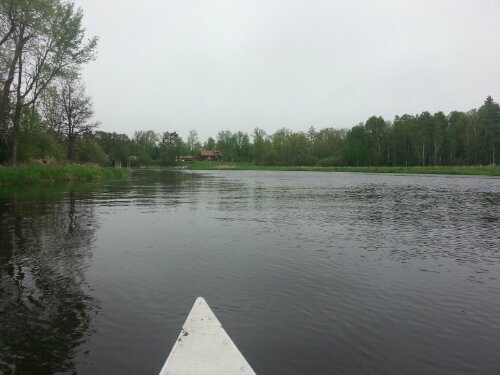 We’ll see if we can slowly get back on track in order to make it to Linnea’s parents cabin near Brainerd this weekend so we can spend some R&R on a lake. And shower for the first time in almost two weeks. This entry was posted in Minnesota by Dave. Bookmark the permalink. Sounds like things are looking up. A shower and a little rest will rejuvenate you. I suppose the cool weather has actually been nice for paddling. Probably not all that fun getting started in the morning though. The forecast for the whole week is cool with rain likely through Wednesday and a chance on Thursday. Friday looks good. Ha, yep, we’re looking forward to Friday! Hi! I am enjoying your updates. My friend and I have paddled from Itasca to Davenport in sections the past 6 summers. If you can, have someone help you portage the Blanchard Dam near Royalton. We found it longer and more difficult than listed on the map. Both take out and put in were accessible by car. 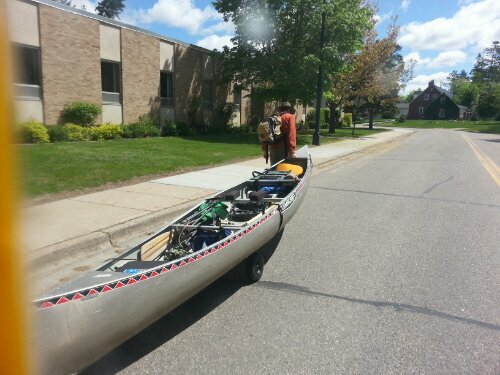 We also had trouble with the Portage at Sartell. Take out was fine but put in was steep and had large chunks of rocks. 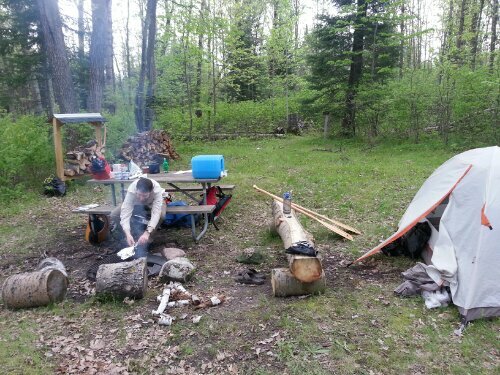 Enjoy this section, we loved the Minnesota DNR campsites! Great into. Hopefully we can be a bit more prepared for them now! I usually do my trips alone, so I accommodate to my own stink after a couple of weeks of no showering. I am curious if you accommodate to each other’s stink? Also, no worries, the river will get wild again. There are sections where it will feel pretty remote when you are only 10 miles from a major city. And in the South it will start to feel very remote again especially the state of Mississippi. You will definitely hear coyotes again especially when they approach your camp at night curious what is camped out on their sandbar. Honestly, I think our senses of smell are tuning it out. I can’t smell either of us anymore. Guess I can only speak for myself though. Aww, Blandin gave me a really nice pen this one time. It wrote soooooo welllllll. Look at all that firewood you had at that campsite! We had so much! There was this cute sign that said “please refill what you can” and I felt bad we could refill 0% of what ww used.